Before tying my last Turk's Head knot, I read an article about taping the ends of the paracord in a point and this got me thinking about the ends. When paracord is heated, it gets really hard so I broke out my wood burner that I purchased from Wal-Mart for around eight dollars and using the flat tip, I started from the end making a sharp point and then went up to about two inches. I have to say that it worked really well and I was able to complete the Turk's Head knot without using my hemostats. I'm not saying that this way is better than using lacing needles but if you don't own any and your in a pinch, this will get you by. You may also use a soldering iron, I didn't use mine because the wood burner comes with multiple tips and the flat tip made it easier to form the point and the wood burner uses a higher temperature than my soldering iron. You can either create a needle for every project you tie or you can cut the needle a couple of inches away from the needle you created and reuse it by joining two ends of paracord together and then cutting it again once you're finished using it. Just remember that the heat makes the paracord fairly rigid, not unbreakable so don't try to bend it because it will break and you'll have to start over. If this method doesn't strike your fancy you may want to use the other method of creating lacing needles that I mentioned before but instead of using copper from a hardware store, a reader commented that you may be able to find some small diameter copper tubing from hobby shops for use on model airplanes and such. Also, if you can locate some hollow knitting needles, they will work but you'll have to improvise a way to make the paracord stay in place. I will be trying both of these new methods as soon as I can find the material and I will let you know what I come up with. Cut a knitting needle to make the total length around four inches. 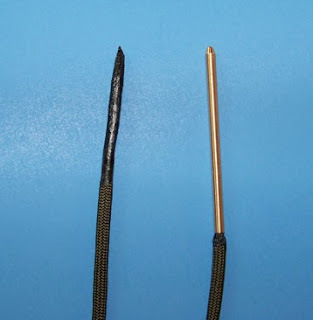 Insert the knitting needle inside the paracord and then tape the needle to the paracord. Grind off the rough parts that are used for the grip and make a point on the tapered end of the shaft. Then heat up the end of you cord just a little and when it cools the hard end will screw into the threads of the dart. A source for brass tube to make your own needles might be a hobby shop in your area. Model makers use smaller diameter brass and copper tubing for their projects. Find a model airplane shop or a model railroad shop in your area and you should be able to find all sizes of brass tubing. Nice site. Thank you for your comment. I haven't thought about that, I guess because there are no hobby shops in my area but I will try to locate some and visit them because that's a good idea. Just found your blog through KHWW. I use a specific type of pen that UPS manufactures for its give away items by removing the innards and taking a hacksaw to the back end, leaving about four inches or so. Decent blunt end for the point. I'll run a wood screw through the end like the tutorial you referred to. However, it's still too big for paracord. I just double up the end by about an inch and screw it on that way. Sure does save me time and money making or buying paracord needles. They're only about $1.00 at the local big box hardware store (Lowe's or HD). A few minutes with a Dremel and some sandpaper (polish them up nice or you risk snagging the paracord sheath as you use them - DAMHIK). aHello I too had been looking for a type of needle. What I found that works great is a dart. I used to shot darts with friends at our local pub. They come in all different sizes and shapes but what makes them so useful is that have threads on the inside of both ends. All you have to do is do a little grinding to take off some of the rough stuff they use for grip and make a point on the tapered other end shaft. 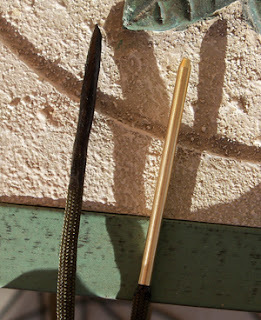 Then heat up the end of you cord just a little and when it cools the hard end will screw into the threads of the dart. @Bravo, that sounds very interesting, I will have to try it out, I like the fact that the darts have threads which will hold the cord. I have another idea i was kicking around. I picked up three feet of copper wire 1/8 inch in diaminter at Home Depot. It' s strong and maluble enough to make straight. I drilled and tapped one end, the other end I made into a point. It can be made what ever lenght you want.